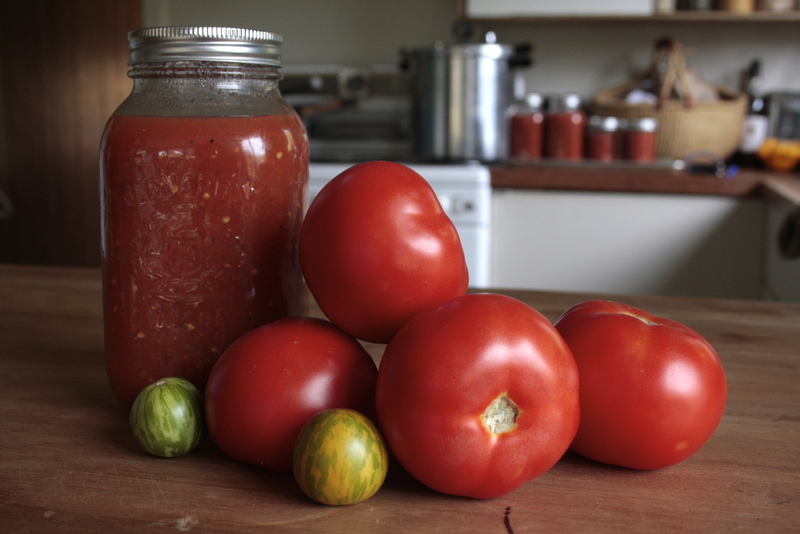 canning | eating with S.O.L.E. A couple weeks back in my flush of tomatoes I canned a mountain of salsa for the first time ever. I did it in the pressure canner and the results were pretty tasty! I am just getting cozy with my pressure canner, and have had nothing but success so far. 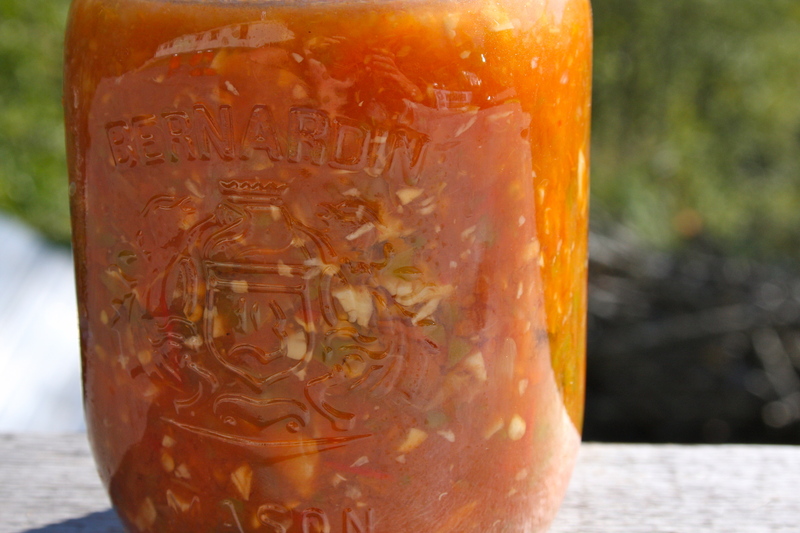 So if you find your self flush in peppers and tomatoes, and want to give pressure canning a shot then give this a go! * you can use a submersion blender to get the consistency you desire, or you can be meticulous and finely chop all the ingreients to your liking. Cook down for about 25 minutes, before portioning into sterilized jars. 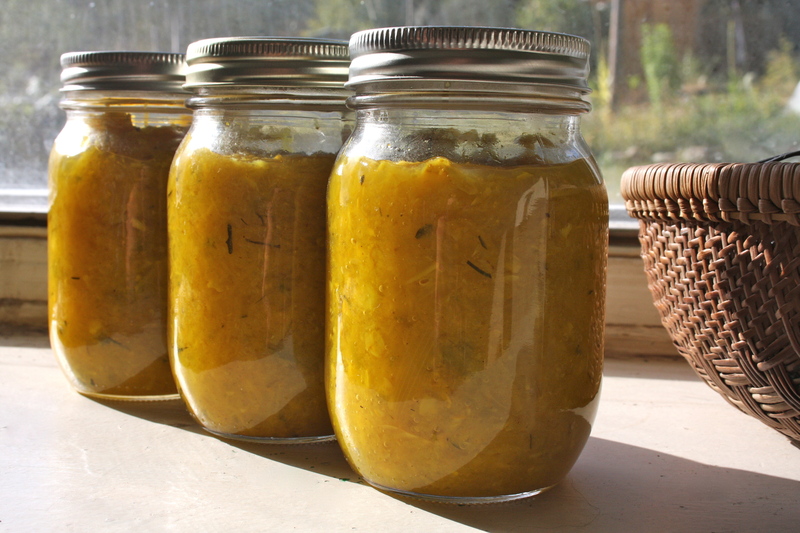 If you are new to pressure canning be sure to read your manual thoroughly, and read some canning literature like this great site. I must be suffering from a little bit of bloggers guilt, busy busy, but no time to write about my adventures in food. So here is a quick summary of the past couple weeks in my kitchen and a recipe for divine fruity and bold HP sauce made with plums. I have been harvesting and foraging like a mad woman. drying, preserving, freezing, and even tincturing. I have also been eyeing up my new flour mill and am eager to get grinding and baking, but the days are so hot, and the simplicity of passive drying is lovely… and much cooler than cracking up the oven. 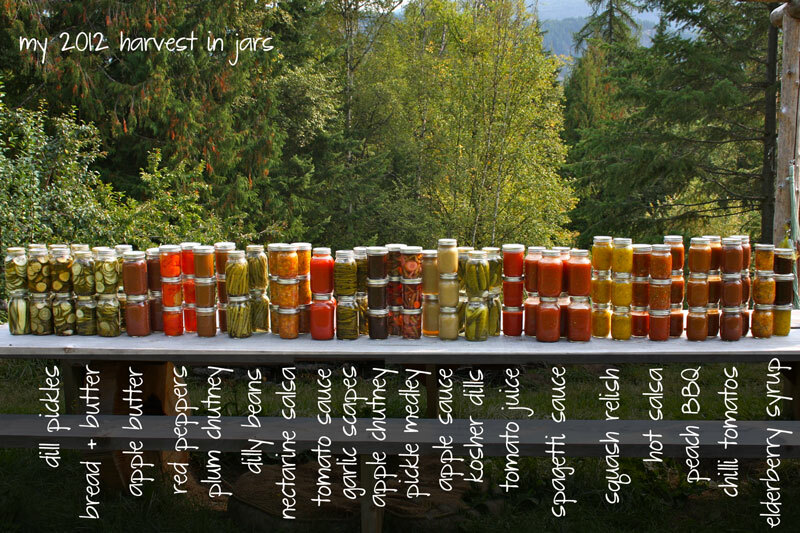 Both my mother and my mother in law visited over the past two weeks, and I undertook some canning with both of them. Helen and I made strawberry jam from berries her and her son (my sweet guy) picked while I was marketing, then the other day my mom and I made plum HP sauce with the two huge bags of frozen plums I put up from my monstrous plum harvest last year. As my freezer is bursting with this seasons berries, it was time to put those plums to use and make some space for the huckleberries we just picked. Meanwhile I have been picking “mosquitto mint” by the bushel-full, making tea (both hot and cold) and drying rack after rack of pristine mint leaves, to get my tea and mint sauce needs met for another year. Along with the mint I have dried ample oregano, as well as chamomile, and lots of red clover flower. I have purchased a wonderful huge 8 tier hanging drying rack, which works like a dream and I am trying my best to keep it full. My new expanded chicken run now hosts a large saskatoon berry tree and the harvest this season is juicy, for both us and the chickens! The fruit is huge and sweet, with very little seeds… I have frozen a great amount of these tasty little gems (with the help of the moms) and plan to use up all of last years grapes and make a saskatoon grape jelly this weekend, with my daughter. 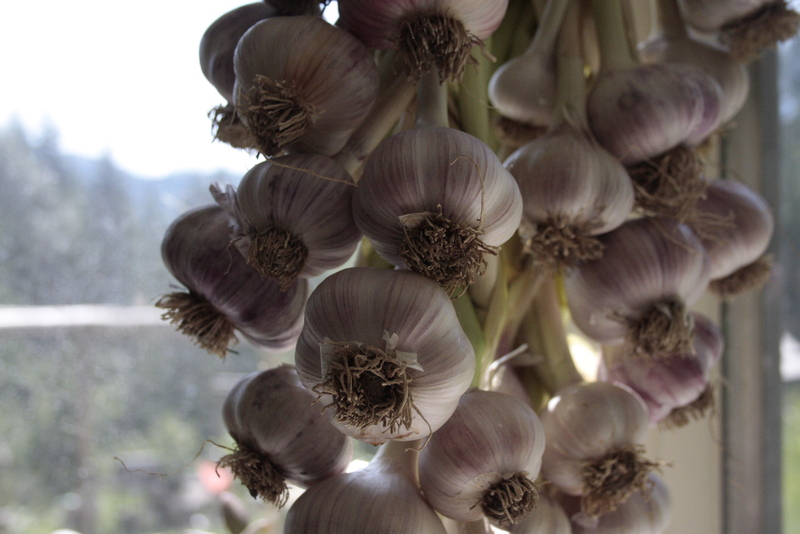 Oh and I harvested my first ever yield of garlic! I have a grand assortment of varieties of garlic drying and just this morning my daughter and I braided up 40 heads in to two large braids, it was our first time braiding garlic, and it wasn’t as easy as it sounds, as we grew hardneck garlic.. but we managed to make it look pretty and I am eager to hang it over my stove. I want to grow 10x this amount of garlic next year, as it is such a rewarding plant to grow; it’s beautiful and the mid summer scape bounus is a great kitchen treat. 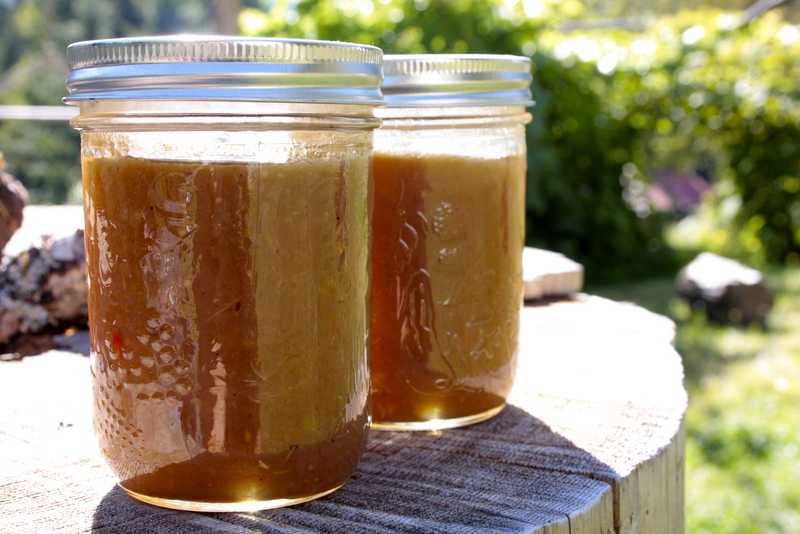 Ok enough about my garden, lets get to the recipe; this is how my mom and I made HP sauce… which we both adore, as do most Brits who loveling refer to the stuff as “brown sauce”. It is a staple in the UK kitchen and cafe alike. I have always wanted to make my own, especially after realizing that these days HP is made mainly of corn and gmo corn by products with the just the right amount of seasoning. After bubbling away for about 15 more minutes, hit the pot with a immersion blender and get the lot smooth and saucy. 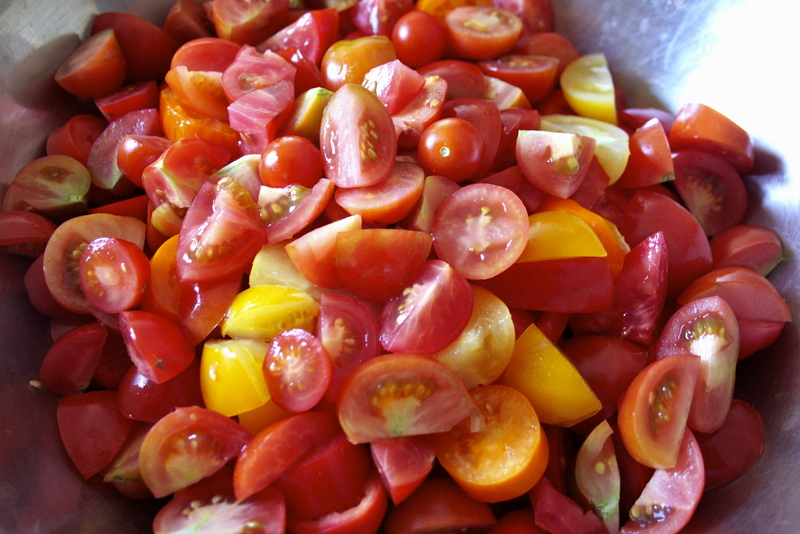 Preserve in sterile jars, and process for 10 minutes in a hot water bath, or using a steam canner. The recipe yields 6 Litres of yummy HP sauce.